Last week, the editorial board of Journal of Algebraic Combinatorics resigned and started a new, open access journal named Algebraic Combinatorics. The previous journal will continue with its publisher Springer-Verlag, although authors in that field will likely submit their work to the new journal. 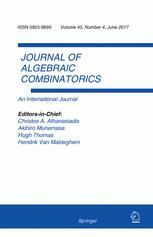 The Journal of Algebraic Combinatorics has flipped, and has been replaced with the open access, self-published journal Algebraic Combinatorics. According to sources on-line, the editors say there was no particular crisis that caused the flip. They viewed it as a natural progression and a reaction to the current state of academic publishing. To those not familiar with academic journals, they typically run as follows. Editors (that is, the academics) work with a traditional publisher (Springer, Elsevier, Taylor & Francis, etc.) and the latter owns the journal and its content. The publisher has a website for the journal, and downloads of published articles usually require subscriptions. Authors submit papers via the publisher’s portal, and editors assign referees to the papers via a document management system owned by the publisher. If papers are accepted, then the publisher formats the paper as per their individual standards; some journals copy-edit accepted papers, but many don’t. Authors check proofs and typically sign a transfer of copyright. The length of the process of publishing a single paper—from submission to ultimate publication—could be months or years, depending on the journal’s backlog and other factors. Editors and referees typically receive no remuneration for their work. Publishers, however, do make a profit through subscriptions. When you break everything down to its simplest elements, running a journal comes down to the following things. Maintaining a journal website and a submission portal/document management system. Paper production and formatting, and the assignment of ISSN and DOIs. I predicate these items on the journal being electronic; that is, not publishing physical copies. I personally can’t remember the last time I went to a library and photocopied a paper from a journal, although I did that a lot as a graduate student in the early 1990s before the web was in place. Academic papers are essentially pdf files, which are easily shared. Hosting a website is cheap, ISSNs are simple to acquire, and the assignment of DOIs is trivial through outfits like Crossref. The more elaborate item is the submission portal/document management system, where editors manage papers, assign referees and make decisions on submitted papers. But if you have such a system, the really only thing left for traditional publishers is the production and formatting papers. That seems like very minimal workload compared to the high cost of journal subscriptions. Timothy Gowers and others began the journal Discrete Analysis to show that all of the above items can be done by academics, outside the paywalls of traditional publishers. They use the software Scholastica, which essentially hosts a website and provides a submission portal. There are modest costs associated with using Scholastica, but they are much less than traditional publication. In 2012, Gowers and others were involved in what has become known as the Academic Spring, which was a reaction to the paywalls created by Elsevier and other publishers. It was also a reaction to the transfer of copyright required by most journals when authors have papers accepted. While there are many home-grown, open access mathematics journals (in my area some are the Electronic Journal of Combinatorics or Contributions to Discrete Mathematics), Discrete Analysis uses the arXiv overlay model of publishing, where papers reside on the preprint server arXiv. Most mathematicians post their papers on the arXiv, especially given the length of time before a paper appears in a journal. The arXiv itself is not refereed, so papers with errors can appear there. However, in the arXiv overlay model, a journal only links to the arXiv paper if it has been refereed and corrected. Internet Mathematics, the journal I run as Editor-in-Chief, also uses the arXiv overlay model. I wrote a post about this earlier. Is JACo a blip or the start of a trend? That is difficult to determine. I don’t think there is quite a trend yet towards flipping mathematics journals, but the elements are all there. As yet, there is no Mathematics Spring on the horizon. Journals tend to be conservative and the bulk of them are still run through traditional publishing houses. Given the increasing ease, speed, and space available on-line, I would conjecture that the trend of flipped mathematics journals will continue, however slowly, kind of like the introduction of electric cars. Ultimately, research papers are pdf files. Refereed and curated, yes, but pdf files, nevertheless. The argument for paywalls to access these pdf files is getting harder to justify. Who will be the next major mathematics academic journal to flip? Which one(s) would you like us to approach? We need to prioritise, so would value feedback. I’ll send you a non-public note about this.